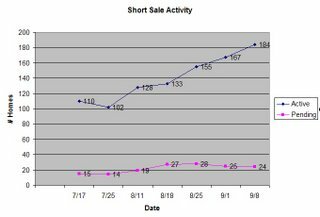 I recently attended a class on handling short sales at the Sacramento Association of Realtors. I figured that would be a good skill to have in the coming months. My concern, however, was that the instructor would paint a pretty picture of the current market and I'd quickly get tired of all the babble. I even thought about just getting the handouts and leaving before instruction started. The instructor made some comments that really blew me away. He had no illusions about the market's current condition or where it was headed. His comments were so close to what we continue to say on this blog (and others) that I thought it might actually be Max in disguise. In his opinion, most people are stupid in an economic sense (his words, not mine). He said they use their homes and ATM machines and have nobody to blame but themselves. He also said the lenders only had one requirement before approving a loan--Can the person fog a mirror? I thought that was pretty funny. With most lenders passing the loans off to the secondary mortgage market, what do they really care anyway if the person isn't going to make the payment on their option ARM in a year or so. Finally, he predicted a 10-15% decline for our local market, which I was surprised to hear from someone in the real estate industry. All in all, a great seminar by a very informed instructor. 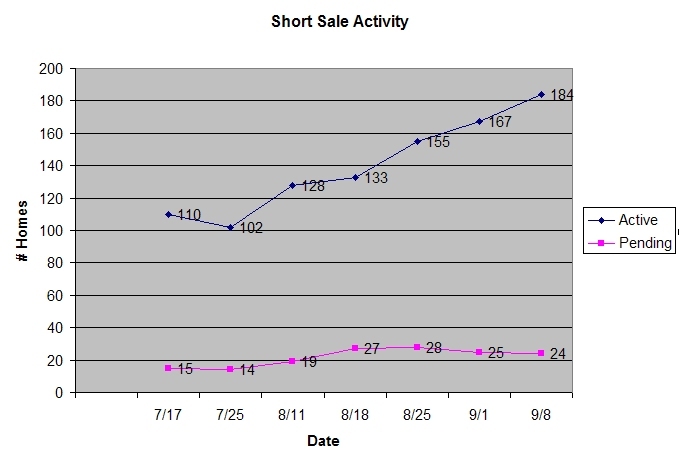 Now, on to some actual short sale stats. Take a look at the graph below. It's only current as of Friday, so I ran a new report today and the numbers have gone up even higher. This is only for Sacramento County too. Wow, that's an 80% increase in one month. I would think the hardest part of a short-sale negotiation would be convincing the bank to go along. How hard is it to get the bank on board, and are some banks that are easier to work with than others? 1) Add their own (or somebody else's) funds to close the deal. 2) Sell short and ask the lender to cover the deficit. 3) Do a deed in lieu of foreclsoure. In short, you're giving the lender your house in exchange for them not foreclosing on you. Each scenario has its own pros/cons. The biggest thing I learned is the importance of whether the loan is a "recourse" or "non-recourse" loan. A recourse loan means the lender has the right to come after you in court for any shortage, while a non-recourse means they don't. Equity loans, refi's, and investor loans are all recourse, which is not good news to a lot of people right now. To answer your question, the biggest problem is tracking down who actually has the loan and finding someone to talk to. So many loans are resold numerous times, that it's often difficult to find the right person to talk to. And, to complicate matters, the company that a payment is sent to may just be a collection agency for the lender. They're unlikely to be very helpful because they want to keep getting their collection fee and they won't if they don't have the loan anymore. But, once you do find the right person to talk to, convincing them to accept a short sale is another matter. They're automatically going to think the seller is trying to stiff them and wants out of a bad situation without a valid reason. Finally, you also should already have a buyer for the property, as 99% of lenders won't discuss any short sale scenarios without an offer in hand. The delays of working with the lender often kill the deal. The bottom line for the lender is they will determine if they can make more money foreclosing or doing a short sale. Great article JR. Debt forgiveness income is a term many will soon come to learn. This guy is stuck hard. He is willing to rent is 7 Bd 5 Ba 4,000 sf home to 5 people at $500 each. FULLY FURNISHED! Bad Credit O.K. if you have income!! In the upscale commmunity of Catte Verdera. I wonder how the stuffy neighbors are going to like that set up? Wow. They paid $782,000 for the house on 5/12/05. The original loan was for $703,770. However, they refinanced at $816,000 on 6/28/06. I'm guessing the loan has to be around the $6K/month range. "...guessing the loan has to be around the $6K/month range." So 5 roomates are going to live in a 4,000 sf, 7 bedroom, fully furnished party house in Catte Verdera for $2500/month, while the owner pays $3,500 per month carry (Plus $700 taxes, $450 mello roos, $150 HOA, $100 insurance, and lots of maintenance when the "roomies" get done)..........all so he can see this $800,000 "asset" shrink in value 45% to the mid $450,000 range. Ouch....that hurts. Flippers were tying up homes with builders in mid 2005. When it came time to close the escrow in early 2006, the Flipper would get the home re-appraised, which supported an equity line of credit, and they would use the line of credit for the down payment. So even though they were buying the home for "X", the appraisal said the value was "X" + "Y". The Flipper had NO MONEY in the deal and BELIEVED his home was already worth more than he paid for it. Watch those loans foreclose in 6 months. Amazing games. Stupid people. Big money is starting to buy into a Goldilocks economy model -- low inflation, moderate oil prices, low unemployment and moderate wage gains. If the soft landing the markets are forecasting materializes then house prices will probably be sticky and stay more or less where they are. Read Mish's Blog for more on the macro debate. There is very little chance the market will stabilize. It is TOO FAR GONE. After all, JTS is selling $1,000,000 homes for $500,000 now (or so they want you to believe!). When the builders are creating that PERCEPTION out in the market, it becomes THEIR REALITY. And that is what we will all be living for 2-3 years downward, then 2-3 years crawling along the bottom. This is history repeating itself, as it always does. Why do we have such a difficult time accepting that fact? And James, if the housing market factors start to move in unfavorable directions (high rates, expensive oil, slowing economy, etc) then it is going to be a much faster, steeper decline. Look at where all the new jobs were. Bet the market will drop 20% - 30% by the time all is said and done.